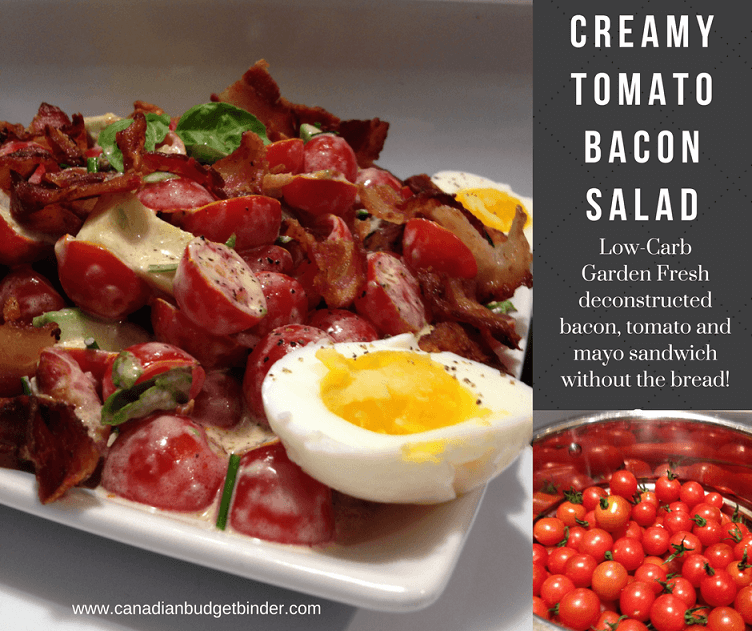 I wasn’t sure if I should call this recipe Tomato Bacon Salad or Bacon Tomato Salad so I went with both only because there’s lots of cherry tomatoes and tonnes of bacon! There’s no pasta or bread in this creamy Bacon Tomato Salad that I’ve created from organic vegetables and herbs from the garden. All you need is a fork, an appetite for freshness and a love for tomatoes and bacon. My wife who enjoys a low-carb/Paleo diet said she was in the mood for a bacon tomato sandwich loaded with mayonnaise on oopsie bread or savoury low-carb waffles. The Oopsie bread and waffles are alternatives to adding extra carbs from eating traditional breads but we didn’t have any made. I’m not a fan of the oopsie bread but when you stop eating bread anything that looks and tastes like bread is a sure winner. With the humidity and heat in Ontario reaching unbearable highs turning on the oven was the last thing we wanted to do. 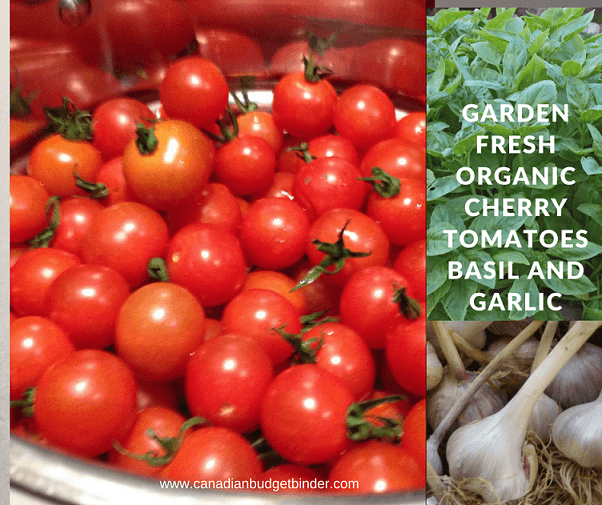 We were fortunate enough to get a huge bowl of organic cherry tomatoes from my sister-in-law and organic garlic from my father-in-law along with our fresh basil that we grow every year. These are 3 main ingredients for this creamy bacon tomato salad. Related: Too much Fresh Basil? Here’s what you can do with it. What better way to celebrate a bacon tomato sandwich then to deconstruct it so you can eat it with a fork. Along the way my wife and I added a few extras to the bacon tomato salad to boost flavours, fat and textures. Avocados are a staple in just about any low-carb diet and both my wife, toddler and I love them. If we could grow avocados in Ontario we would but we know that would never happen. They are full of healthy fats and a great way to add fat to a keto diet such as the Atkins diet. The dressing for the bacon tomato salad is a combination of mayonnaise, salt, pepper and apple cider vinegar mixed in a bowl and poured generously over the salad to coat everything. You can also substitute the olive oil for bacon fat if you want to boost the fat content of the salad even more but generally a good olive oil is all you need. You will also find gorgeous hard-boiled eggs on top of our bacon tomato salad which actually tastes like you are eating an egg salad sandwich and a bacon tomato sandwich at the same time. It’s good, trust me we’ve made this recipe a few times now and the entire bowl of cherry tomatoes are gone. We’re hoping for another free bowl of tomato pickings to come our way but that might require more babysitting by Aunty Mrs.CBB. There’s nothing better than tasting fresh produce from the garden and between in-laws there’s more than enough to feed 10 families. If your grocery budget is tight like ours and can’t always afford to buy organic then simply use non-organic produce instead. The taste will be bump up the value of this recipe if you use organic but even at $5 for 2 organic bulbs of garlic that can get pricey for just about everyone. Related: Local Organic Food Sources In Canada Find out where to source organic produce close to you. Alternatively make friends with gardeners in your area and swap services or watch for home gardeners who give away free produce in Facebook groups because they have too much. Low-carb eating means you can indulge in bacon almost every day of the week if you like but in moderation. When my wife enjoys bacon she will add 2-4 slices per meal which seems like lots but not if you are in ketosis and want to stay there. Even though low-carb and keto-living is not about just protein it’s important to get a good balance of fats, protein and minimal carbs. These days bacon is not cheap so when it goes on sale we jump on it. We’ve thought about buying a pig and making our own bacon but we don’t have the time. Good bacon can run about $10 or more a pound but when you have a tight grocery budget you go for the best deal possible. Lately we’ve found bacon for about $2.88, $2.99 or buy one get one free for 375g- 1lb. We often look for reduced bacon on sale for 50% off and freeze them for later use. If you are buying bacon be aware of the carb count on the back nutrition label as some companies add sugar to their bacon which is not something you want to increase in your low-carb diet. Bacon lovers rejoice…it’s time to get cooking!! We bake our bacon in the oven but not this summer, hell no. We conveniently have a counter-top convection oven that we use for just about anything that requires the oven. The bacon cooks evenly and without all the mess which is fine with us. We save the bacon fat to use to cook meals for my wife too. The key to the best cooked bacon is low and slow. You want a uniform colour and just the right amount of crunch, especially for a tomato bacon salad like this one. 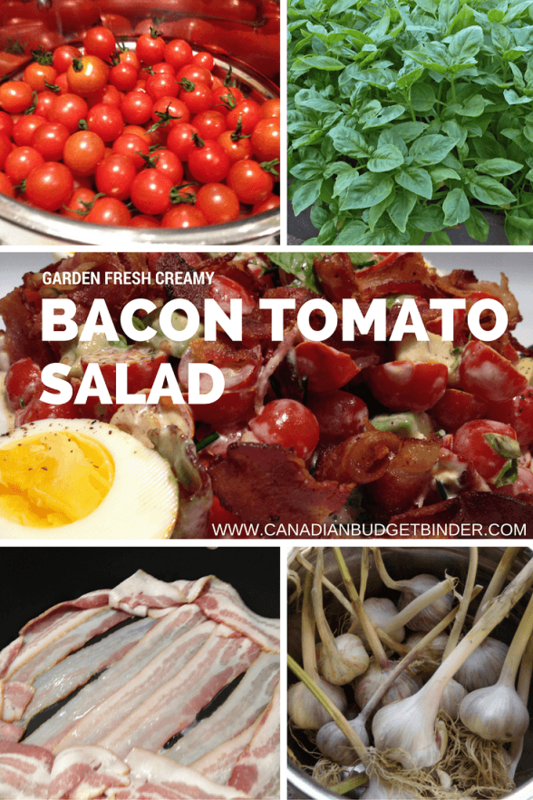 Summer Fresh Salads start with the best ingredients so if you are able to locate garden fresh organic produce from your garden or farmers market this tomato bacon salad will blast your mouth with amazing flavours. Note: If you don't have organic you can simply use fresh produce from the supermarket. In a large bowl add your cleaned and halved cherry tomatoes, bacon pieces which I like to make a bit larger so they stand out on the plate, avocado chunks, chopped basil,garlic, salt, pepper and chives. In a small mixing bowl add your mayonnaise, extra-virgin olive oil, apple cider vinegar then mix with a spoon. Pour this mixture over your tomato salad and gently mix so you fold the dressing into the salad. Let the salad sit covered on the counter for about 10 minutes so the flavours come together and serve. We top each serving with a hard-boiled egg but this is optional as well. I also save a bit of the bacon to top on each serving at the end so it makes the dish stand out as well but this is optional. We like to create a variety of salads in the summer so we don’t get bored of eating the same kinds over and over again. Use your imagination like we did today to create this creamy bacon tomato salad and it can be eaten as a full-meal or side-dish to a nice grilled steak or sausages. Total Net Carbs for entire recipe including 4 eggs = 41.30g/6 servings= 6.86 net carbs per serving. Yay! Another bacon dish! 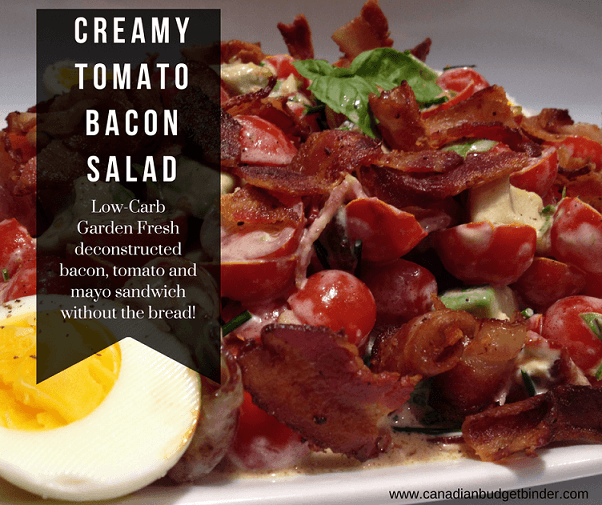 I love this creamy bacon tomato salad! That looks so delicious! And, it’s easy to do as all ingredients are easy to find. Yes it’s super easy!! Enjoy. This looks so good!! I have some sale bacon in the freezer from earlier this year to use once the weather cools down. I usually cook the whole pack and hope I can get 2-3 pieces for myself before the plate is cleared!! What temperature and for how long do you do the bacon in the oven??? I’ve seen several temp/time amounts. 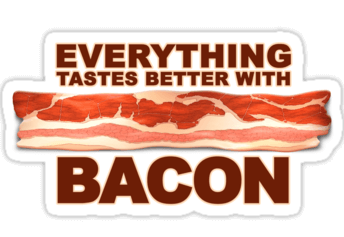 Since bacon varies from company to company I just eyeball it. I put it in the convection oven at 250 for 15 minutes then 300 to crisp it up. Never leave bacon unattended.